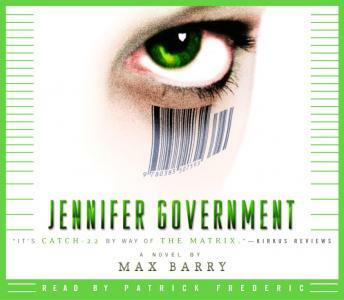 A wickedly satirical and outrageous thriller about globalization and marketing hype, Jennifer Government is the best novel in the world ever. I had high hopes for this book about capitalism taken to an absurd degree. The characters were interesting, and the plot was amusing. But it felt over-abridged -- like some jump-cut music video version of a story. It was good, and worth a listen, but I am left wondering if I should go pick up an original unabridged copy to get what was left out. I love this book. It's a clever satire, inter-mingled with a fast-paced almost trashy crime novel. Having read it previously, the audio book reminded me just how goood it was. It makes some great points about the way modern society is heading but makes them in such a snappy entertaining way as to avoid any preaching. A delight from start to finish. I enjoyed this satirical future novel, which like all good satire is very close to the truth. The book is pretty funny and I certainly plan to look out for other books by this author. Couldn't get through this book. I sent it back before I finished it. It was an interesting concept but it just lost me. Great futuristic story. Keeps you guessing, even when you think you've figured it out. Well read and well written without being too corny. Good audiobook; would have been harder to read, I think. Very clever twists and turns of the story intertwined with social commentary. The latter makes the story sometimes preachy but, at the same time, there is a dark truth about our near future that should make us all pause before we plunge into the corporatized future. The story reminded me of a variation of a very well-written book called "Oryx and Crake," by M. Atwood, which I would highly recommend. Jennifer Government is a somewhat intelligent and thought provoking look at the dark side of capitalism that sucessfully avoids what could potentially be a serious and severe mood setting by frosting the plot in sheer hilarity. The story line lacks any real depth and the characters are plastic cutouts at best, but believe it or not, that synthetic veneer is a good part of what makes this book so good. The dialog between characters is incredibly funny and the narrator delivers the characters of John and John Nike perfectly. Underneath the comedy though is a not so subtle poke at capitalism and consumerism in the modern world. Good little book, just don't expect it to blow your mind. I loved this book. I actually wish that it was available in the unabridged version. It is very well written. It is an amazing piece for Barry and I am excited to read his others! Neither well-conceived nor well-written, this novel is set in a reductio ad absurdum of free-market economics. Comes off more as a left-wing diatribe than entertainment. Had it been a movie, I would have walked out.